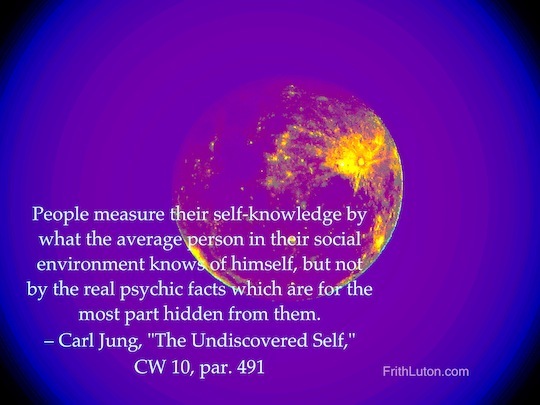 Jung pointed out that knowledge of the ego-personality is often confused with self-understanding. In the process of individuation, one of the initial tasks is to differentiate the ego from the complexes in the personal unconscious, particularly the persona, the shadow and anima/animus. A strong ego can relate objectively to these and other contents of the unconscious without identifying with them. Because the ego experiences itself as the center of the psyche, it is especially difficult to resist identification with the self, to which it owes its existence and to which, in the hierarchy of the psyche, it is subordinate. Identification with the self can manifest in two ways: the assimilation of the ego by the self, in which case the ego falls under the control of the unconscious; or the assimilation of the self to the ego, where the ego becomes overaccentuated. In both cases the result is inflation, with disturbances in adaptation.